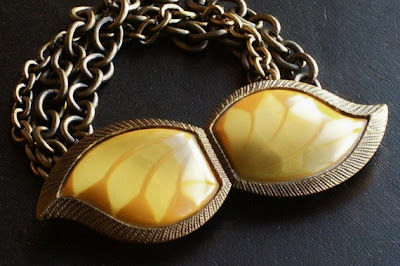 My dear friend, Jill, has the most to-die-for jewelry in her shop! 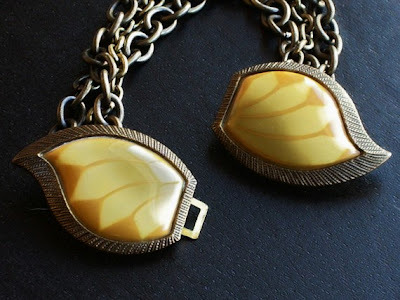 I always browse longingly at her creations, and I love to share them with others :) This post is inspired by her new piece, the Joplin bracelet. "A curvy vintage buckle with textured metal borders and smooth celluloid centers brought together with three strands of antique brass. Buckle section measures 3 x 1 inch"
If this wristlet delight is sold out by the time you get to her shop, I highly recommend the Delicate Threat necklace. I have one and wear it at least one day each week! So pretty! I love the buckle.